The Green Events program at the Office of Sustainability works to reduce the environmental impact of events on campus. We work with clients throughout the event planning and execution process, providing guidance for sustainability-related improvements in six major categories: Venue, Decor, Communications, Transportation, Food, and Waste. We want each client’s event to be a success just as much as they do. We are excited to have partners joining us in the quest for a sustainable future. 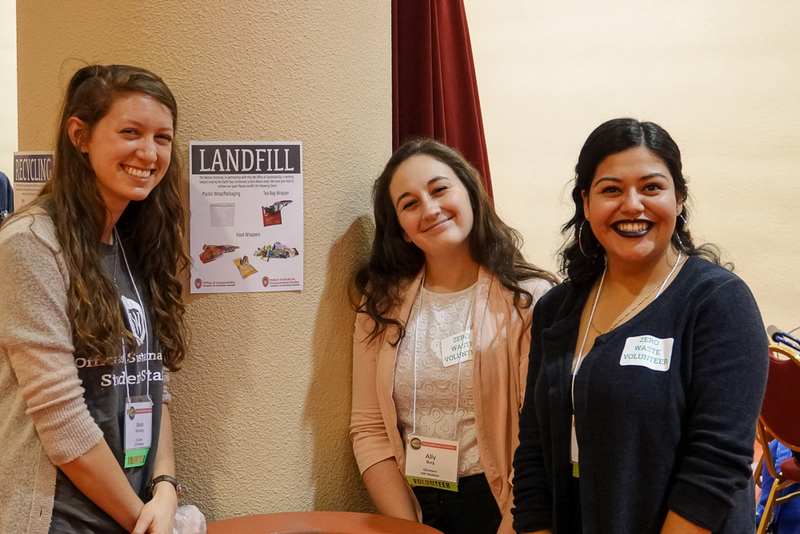 Intern volunteers Anna Weinberg, Ally Burg, and Noemy Serrano (L-R) pose near a zero waste station in the exhibitor hall at Monona Terrace. An official certification program will be launched in Spring 2019, complete with four levels of certification: Bronze, Silver, Gold, and Platinum. Leading up to the launch of our certification program, the Green Events team would be happy to work with your event to make your planning and purchasing decisions more sustainable. Please contact the Green Events team with any questions or if you are interested in working together to reduce the environmental impact of your event.